Well, here we are again. Moms and dads all over are going shopping for bags and books, making sure their kids have all the gear they need for the upcoming school year. And if you haven’t already taken care of it, it’s also the perfect chance to take your child in for a comprehensive eye exam. A huge percentage of learning is achieved visually. Yet interestingly, in spite of this strong correlation between eyesight and learning, a lot of people seem to be unaware of this, and don’t include a visit to the eye doctor as part of their child’s back to school health check-up. 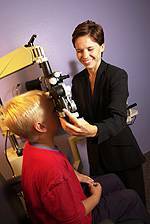 As your child’s vision may change frequently, regular eye exams are crucial to their academic success and self esteem. It is especially important to monitor the signs and symptoms of vision problems as your child progresses in school. Some warning symptoms include trouble seeing numbers or letters, frequently watering eyes, eye rubbing, extra close reading distance, avoiding small print, and head tilting. Inadequate vision and increasing visual demands like smaller print in textbooks or additional homework may noticeably affect their academic performance. Recently developed classroom technology, such as the use of interactive whiteboards, can also potentially exacerbate subtle but significant vision problems. If a student doesn’t have good enough vision, it isn’t just their performance at school that is affected. It’s mentally and emotionally tough on them also. If your son or daughter already wears glasses, now is also a perfect time to see if their current frames are right for them. If you want the student to wear his glasses, he better be happy them! Be sure to come see us as part of your back-to-school routine. We want to help our young patients begin the academic year with their vision in check.